Geçen yıl olduğu gibi, bu sene de kanser araştırmalarına destek ve de bu talihsiz yolda kaybettiğimiz sevdiklerimizi hatırlamak için 27 Eylül Pazar günü Cancer Research 10 km koşusuna katılıyorum. Geçen yıl sizlerin büyük desteği ile 925 £ topladık ve bunu kanser araştırmalarına aktardık. Kanser, tedavisi çok meşakkatli ve de masraflı olan bir hastalık. Umarım gelecek nesiller yeni bulunan tedaviler ile kanserden uzak bir hayata kavuşurlar. Bu koşuda da sponsor olup, bu güzel amaç için destek vermek isterseniz lütfen yukarıdaki link'e tıklayın. 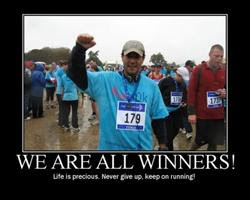 Thanks for visiting my CANCER RESEARCH 10k Run fundraising page. Another year, another run... Last year's event was a fantastic, memorable experience. With your donations I raised £ 925. You are all great, thank you so much for your support! This year, the souls of Ayfer Poray, Oguz Acan, Safa, Saban, Melek, David... will be with me again. I know that they will look at me from the sky and smile... This run is going to be also for myself as well. Some of you know, it is nearly 5 years since my own cancer experience. Well, this is life and things happen! I know you all want to own a Ferrari or a country house but the moral of the story is; appreciate your good health first and remember that life is precious. The rest... will come eventually (I am not sure about the Ferrari, but try to be happy with a Fiat Panda... - at the end of the day both are part of Fiat Group heh!). Here is the usual stuff. Donating through Justgiving is quick, easy and totally secure. It’s also the most efficient way to sponsor me: Cancer Research UK gets your money faster and, if you’re a UK taxpayer, Justgiving makes sure 25% in Gift Aid, plus a 3% supplement, are added to your donation.Please remember that Cancer Research has been helping a lot of us. Now it is our turn to do something little. So, I'd appreciate if you sponsor me! Don't forget, a small drop can create a lake!